Sewer pipe inspection cameras are crucial in assessing a sewer line. Without them, a simple sewer line repair can become expensive and have extensive damage your property. We have cameras able to inspect 1 inch pipes up to 2 foot diameter pipes. We have a large range of cameras! Most homeowners will have an idea of how far out a problem would be in the sewer line. This information comes from the drain cleaning contractors that have written receipts and offer a footage of approximately how far the problem could be. Recording for your insurance company. Here is an example from a residential sewer line that is Orangeburg pipe. The pipe is tar and paper and over the years, the pipe becomes warped and deformed allowing for roots and sections of pipe to break. Here is another video inspection of 4 inch cast iron pipe. The customer was having back ups and was getting a sewer cleaning once a month. The drain cleaner wrote that approx. 13 feet out was where he was clearing the sewer line for the back up. On the top right of the screen you will see a footage counter showing how far we are into the sewer pipe we are. We found from inspecting the sewer line, there was a fitting installed incorrectly that was causing flow to go backwards up another pipe which was causing build up and lead to a back up. Here is a sewer inspection of a clay lateral that has major root infiltration. This sewer line was in a emergency condition. The roots had cracked the clay pipe and was collapsing. We did a trenchless sewer line repair to remove the damaged clay and replace with HDPE pipe. We will not excavate your driveway, sidewalk, hardscape, and we will also go under trees and other major utilities. Your old sewer line is removed and a new, stronger, joint less pipe will be installed. You will be back in service much faster. We can install over 150 feet of pipe in one day. That means less time that you have to wait to use your shower and toilets. This is very convenient. Excavating would take a couple days, leaving you in a hotel or in-laws house to wait for the install to be done. 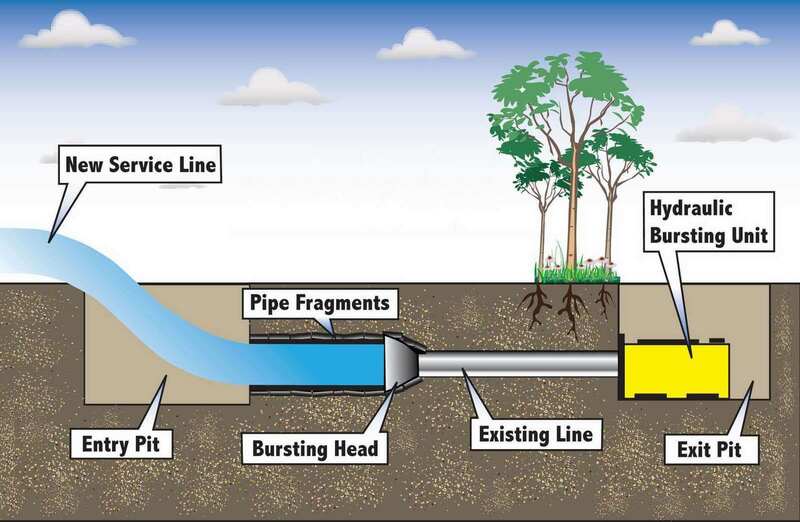 Follow up to make sure your sewer line is working properly. 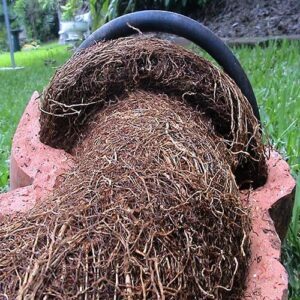 Roots can cause major collapses in your sewer line. 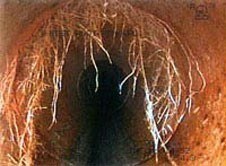 Once roots get inside your sewer line, if the roots expands within the joint of a pipe, the pipe has to crack in order to allow the growth of the root. With the chemicals used, they will push roots away from your sewer line and increase the lifespan of your sewer line. 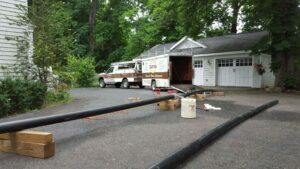 Our company has been performing sewer installation and sewer repair in Bergen County NJ for over 30 years. 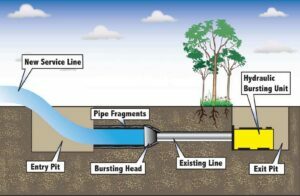 We have become an industry leader in innovation and knowledge of underground piping. We change with the times by keeping up to date with technology, such as locaters and trackers, which assist us to complete the job in a timely and correct manner. Dutra Excavating & Sewer does an average of 350 sewer repairs and installs each year and our business is growing. Dutra Sewer and Water has installed water lines in Bergen County for more than 25 years. Additionally, we have offered 24-hour emergency response to water line breaks for over 10 years. Dutra has the equipment to sleeve a new line through your old water line without disturbing any landscape and there is no trench across your front yard. This cuts down on the cost and disturbance to your property. Call today for a free estimate! Dutra makes and effort to be educated and comply with the most up to date OSHA standards. Safety is crucial to every job Dutra does. This is what puts Dutra above their competitors. Dutra can repair drainage on all levels. From your landscape drains to your footing drains. Their inspection cameras can pinpoint the issues in your drainage system so you won’t have to replace the entire system, most of the time the problem is a crushed pipe!! Dutra is an expert in manhole rehabilitation in Bergen County NJ. 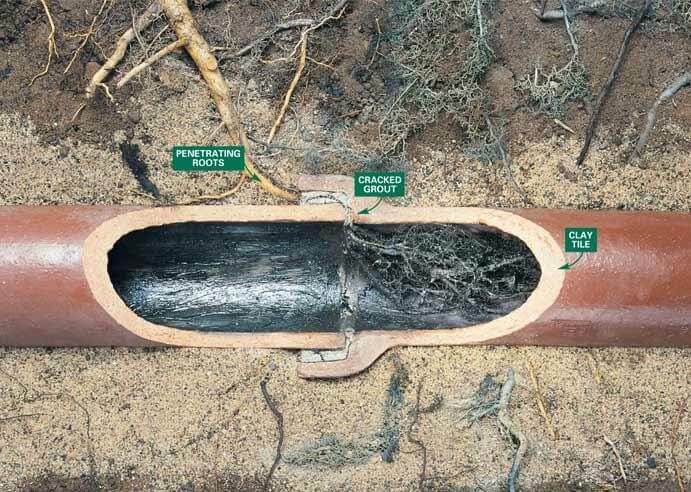 Over time, manholes corrode and deteriorate, making them dangerous and vulnerable to collapse. Additionally, aged manholes are susceptible to root infiltration. As an experienced sewer service company in Bergen County NJ have the training and skill to resolve every manhole problem they encounter.